Our plan is to do a mix of a couple different chairs. We still love our leopard Eames Management chairs and think they would look really good with the camel and evergreen leather options here! Or maybe that amazing woven leather? Am I missing any other good ones? For now we are sticking with our simple Ikea desks, but may have plans to rearrange the space and change them out in the future. I love the clean, modern lines of these desks! I think we’d all like having some options that have drawers, but that still feel really light and open. 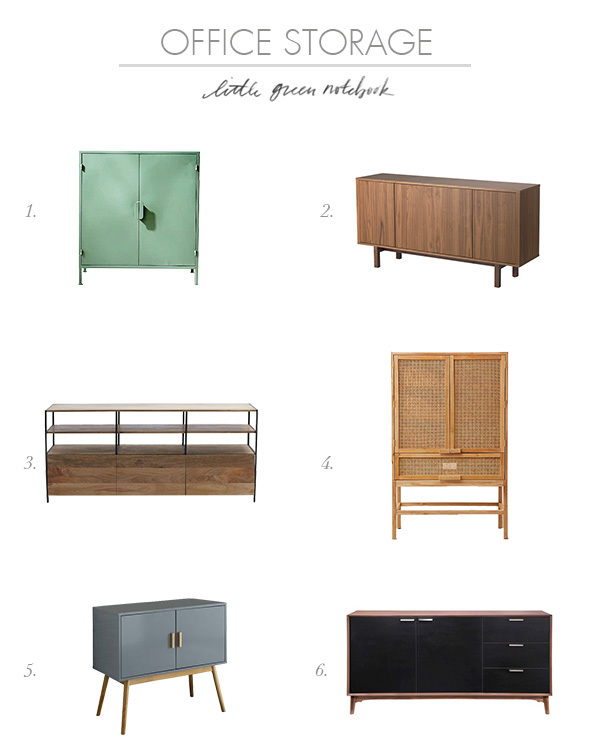 I am completely, totally obsessed with those green metal cabinets! That COLOR! How amazing would a few of them look lined up on our new shiplap wall?! We also need a few cabinets with drawer storage for the east wall of the studio and a couple of these I think could fit the bill nicely. We are also loving that tall caned cabinet from Urban Outfitters, which is very similar to the one we have had our eye on at Ikea. It’s supposed to be back in stock in August at our local IKEA, but last time it came back in stock, they sold out in a morning! Sad! Maybe I’ll just grab the Urban version instead? 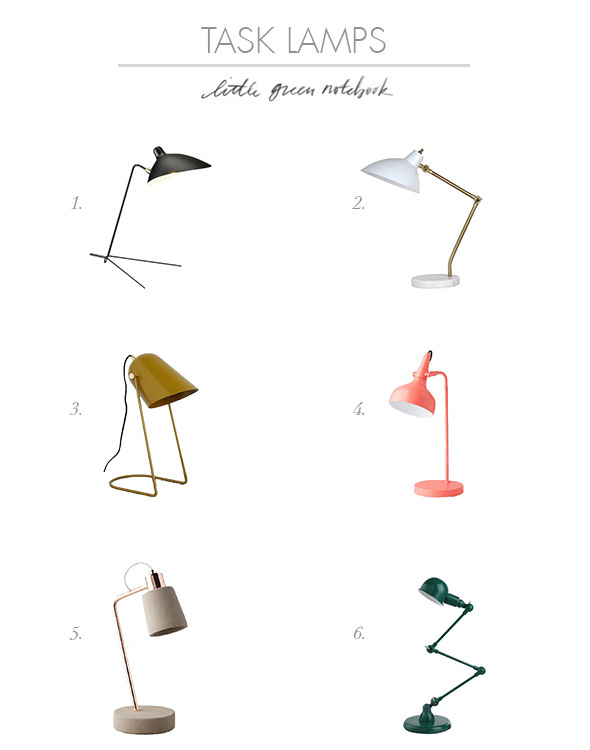 There are so many great task lamps out there right now, especially in the budget range. Every single one of us here is obsessed with the this gorgeous lamp. Wouldn’t it be pretty to have one on every desk? I think we could swing it at that price too! It comes in copper, mustard, brass, white and black. I have a feeling the hard part will be deciding between so many great color options! Which is your favorite? 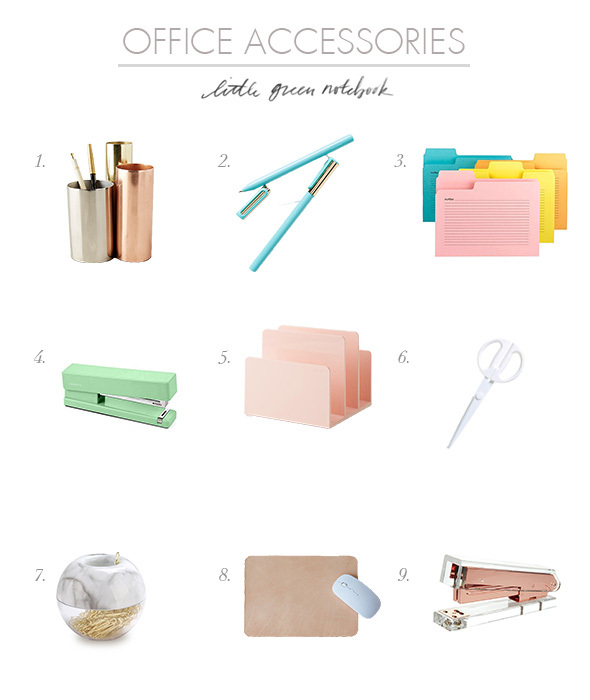 Do you have any office must-haves that you can’t live without? Do not purchase bi-cast leather products, like tge chair from World Market. The leather will peel with regular use. I cannot wait to see what you do to this space. So many good options here. I think those camel leather desk chairs would feel so good in the space. Bring some warmth to the vast white-ness. But the green leather option is so good too. I love the idea of little hits of green as a nod to LGN. Also just wanted to say for drawer storage you could look at installing a big Ikea Besta fauxdenza type situation. I have #16 as my desk chair and I am not in love with it. The white “leather” gets SO dirty and it’s just not as comfortable as I had imagined. If I had to do it all over again I would definitely be looking at that World Market chair or something from CB2. Also, I have the Audrey lamp from Target in Black and it is So. Nice. Really sturdy and you can’t beat the price. I would say grab those as soon as you can because they will go fast! Jill, I am loving Target’s lighting options too! There are so many good ones right now and I agree about the quality! And good to know about the white leather. I’ve heard magic erasers help a lot! I LOOOOOOVE the green, Katie! :) Can’t wait to get them! I only wish you could order the IKEA cabinet online. It’s only available in stores. 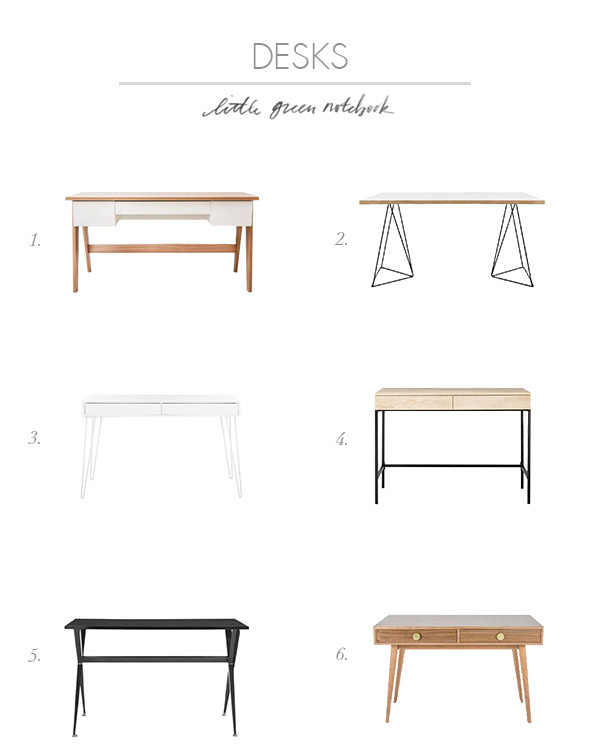 Have you seen the Stash desk from Blu Dot? I’m sure you have but just in case… it is clean and open with a drawer. The graphite on ash is my fav. And with those green/camel chairs, leather mouse pad and new WE lamp… so perfect! I have #10 from the chairs and it is cute and decently comfortable but it doesn’t tilt! I never even thought to look at that factor, but I wish I had! I’m planning to buy new furniture for office. This post and the comments on this post gave me an idea on what to buy. Thank you! Quality seating arrangements for the workers of a workspace is essential and it could also enhance productivity in an indirect way.